Matthew McConaughey visits "The Tonight Show Starring Jimmy Fallon" at Rockefeller Center on November 6, 2014 in New York City. Firefighters, police officers and 911 operators in Houston, Texas, got a surprise lunch from a famous local as Oscar-winner Matthew McConaughey showed up with roasted turkey to give thanks on National First Responders Day. The actor's appearance and catered lunch Sunday shocked those at a fire department. Later, he did the same for police officers and 911 operators at other facilities. In an interview with The Associated Press, the Austin native said he wanted to do something in his home state, particularly for Houston. The city dealt with the devastating effects of Hurricane Harvey last year. He went as part of a promotion for Wild Turkey, for which he serves as a creative director and spokesman. "This year, I said, 'Let me get you down here to my home state,' and what's a good place to go," McConaughey said. "Harvey just hit last August here. So much of Houston was under water. ... We're going around here today, delivering a turkey, a little bourbon and a little gratitude to the men and women who responded first when that disaster hit," he said, though technically, no alcohol was given to first responders on duty. McConaughey also met with Houston's mayor, Sylvester Turner. Turner told the AP that McConaughey embodies the Texas and Houston spirit with his generosity, but also "never forgetting his roots." It wasn't the 48-year-old actor's only civic duty of the weekend. He told the AP that he voted Saturday, braving an hour and a half wait in line at an early polling place. "It's not one of those lines that you get moved to the front, nor should you get moved to the front. 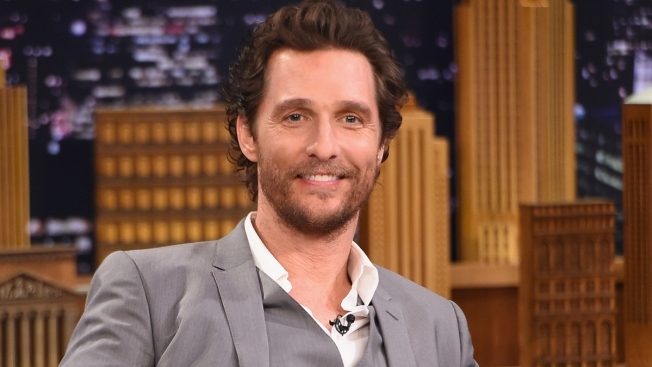 It's one of those common denominators, 'Hey we're all in the same place as Americans,'" McConaughey said. He said even though the U.S. may appear politically polarized and divided, he thinks it's a phase and "we'll come out on the other side. We'll find our proverbial water line." "It's the push and the pull," McConaughey said. "There is a divide there to push. I'm preferably aggressively a little more centric. But we'll see where we come out and getting out to vote is the first step in doing something about it. "